...if you have a Kindle, that is. 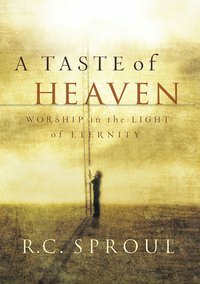 Sproul's book A Taste of Heaven is available for free today at Amazon for immediate download to the Kindle. Like Sinclair Ferguson's book last week, this is probably a one-day-only offer. In A Taste of Heaven, Dr. Sproul examines the key components of prayer, praise, and sacrifices that God gave to His people in the Old Testament. He shows how biblical principles can guide today’s worshipers, for the Lord has designed worship to give His people a taste of heaven. As a side note, I am unhappy with the way that this e-book is formatted. The text is unpleasant, and too large. The Ferguson book was formatted the same way. But nevertheless, it is still a free book, and I could see many disagreeing with my assessment of the font. There are also free kindle e-readers for the iphone/mac/pc and I believe android.